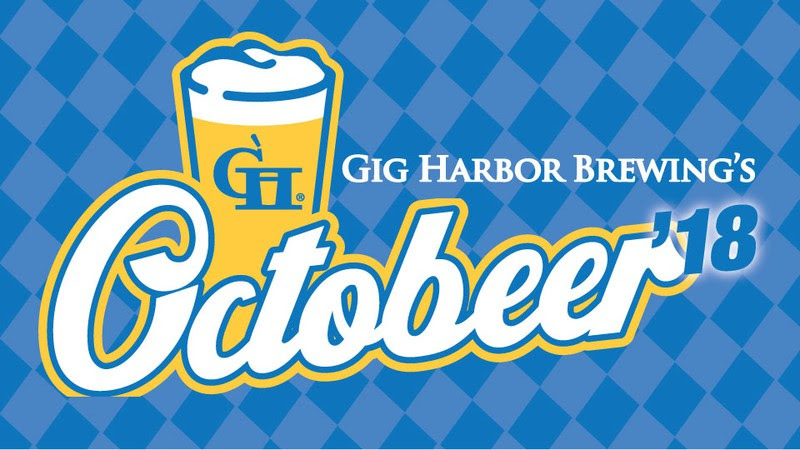 Gig Harbor Brewing Co’s Harbor Taproom is where the action is on the waterfront this fall. 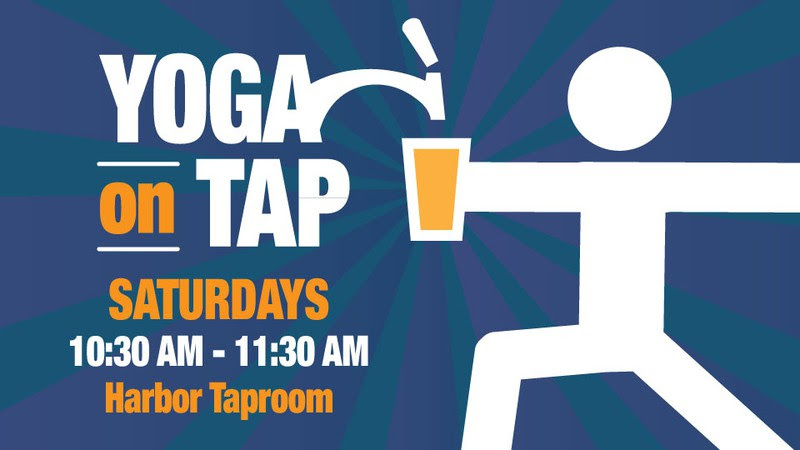 From finding your peaceful Zen place with Yoga On Tap, to cheering on your favorite football team on the large screens, the Harbor Taproom has a full menu of activities on tap. The Seahawks are on! Enjoy the game while sipping your favorite craft brew. There’s not a bad seat in the Harbor Taproom. In both our Gig Harbor and Tacoma Taprooms, you are welcome to bring in your own food from home or from your favorite restaurant. At the Harbor Taproom, ordering from The Trolley @ the Boatyard is fantastic, quick and convenient – they’re right next to us at Gig Harbor Marina & Boatyard. We make it easy to decide while you sip with menus throughout the taproom. 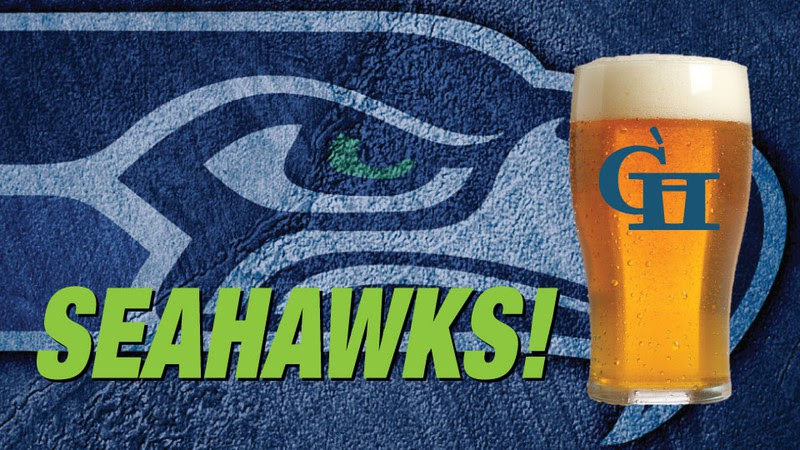 Gig Harbor Brewing loves the Seahawks and all our beer fans who feel the same. This year we’ll be spinning the wheel for discounts throughout the games. 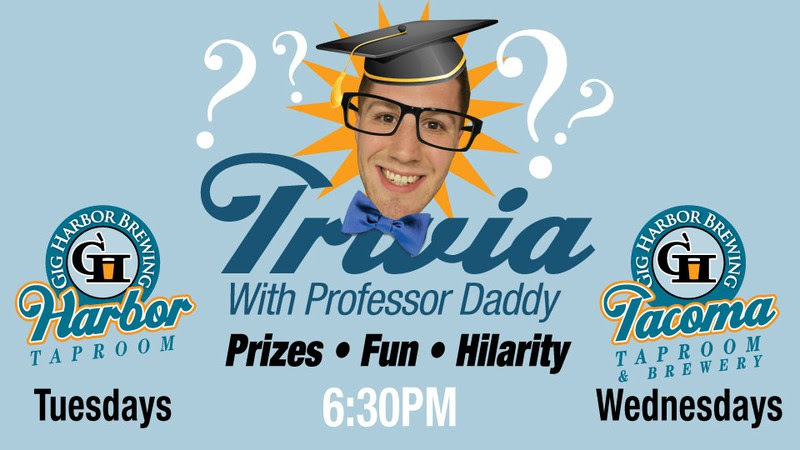 Also new to the Harbor Taproom starting Tuesday, Sept. 11, it’s Trivia With Professor Daddy! Win prizes, enjoy cold draft beer and compete with your friends & family. See you in the Taproom, trivia heads! Just stop by either Taproom, pick up your Octobeer punch card and enjoy the beer you already love. 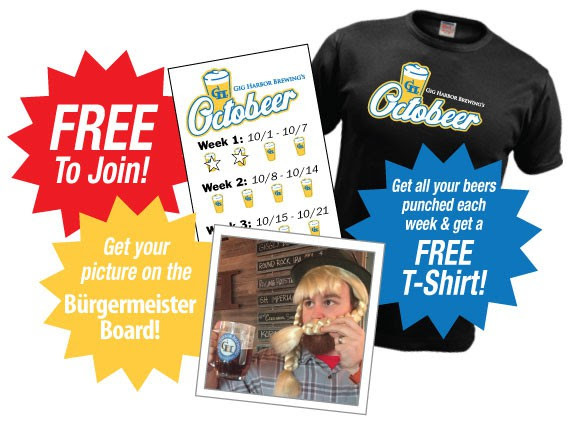 Get your Octobeer ’18 card punched four times each week in October and you’ll get your photo on the Bürgermeister Board and receive a FREE Octobeer t-shirt. * Sign-up sheets will be in both Taprooms later in September. *Only four card punches per week. We encourage you to consume only 2-3 pints per visit. T-shirts will be available to order after 10/31/18. 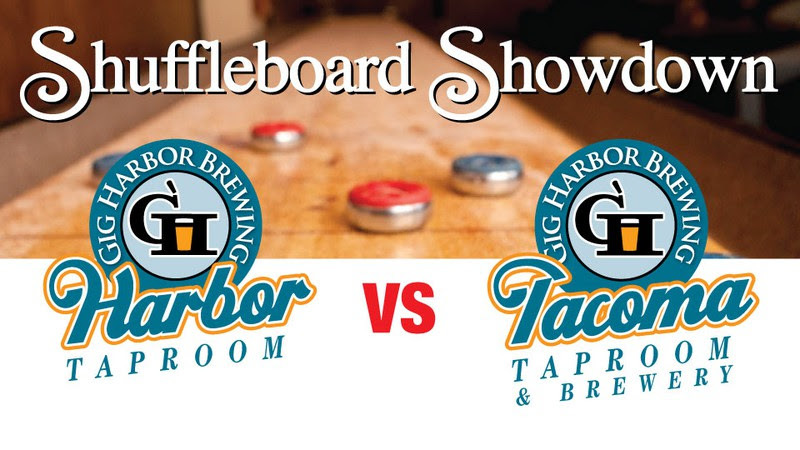 It’s a classic Two-Taproom battle for shuffleboard dominance. Who will win? Location Tourneys • Tuesday, Oct. 9, 6:30 p.m. at the Harbor Taproom & Tacoma Taproom. Four Location Teams compete against each other • Single Elimination • Prizes • Beer Discounts • Free Peanuts & Chips. Championship Tourney • Thursday, Oct. 11, 6:30 p.m. at the Tacoma Taproom. Winning Location Teams compete for Championship • Best Two Out Of Three • Prizes • Beer Discounts • Free Peanuts & Chips. 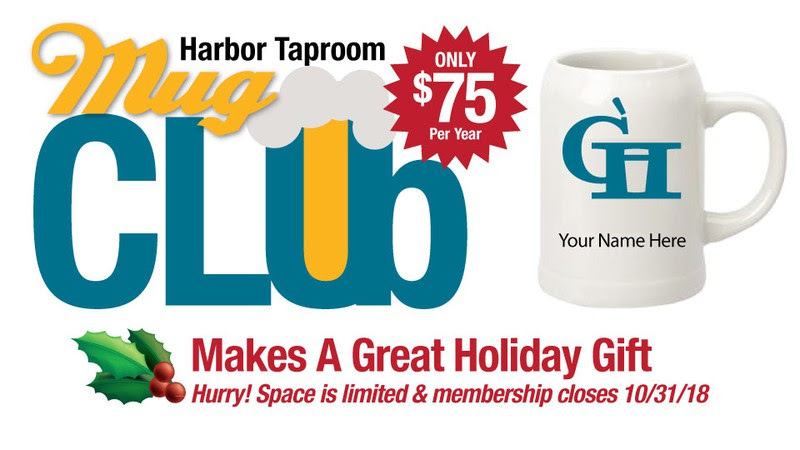 New to the Harbor – 2019 Harbor Mug Club! • A 20-oz. beer for the price of a 16-oz. pour all year long! Sign up today – there are only 70 memberships open. Price is $75 for the entire year. Sales close on 10/31/2018, so hurry!